Communication gap has been drastically reduced over the last few years of internet evolution. We have the advantage of getting in touch with anybody in any corner of the world. Internet allowed many kind of technologies and applications to be built on top of it. One of the most important area which revolutionized was communications. With the help of mobile phones, laptops, desktops, tablets among other communication devices, we are able to communicate efficiently. But, there’s a problem which needs to be resolved. And Blockchain in communications can be effectively achieved through blockchain. What is the problem with Communications? Many applications are being built for the people to use and they store the user details in centralized servers. The main concern with the central servers is that the ones who have authority can tamper our data or misuse it. The people don’t have control over their data. Whatever you communicated with your friend or a colleague or a business partner exists for other to take a peek on it. The possibility of fraud is highly likely. Let’s say you communicate with someone about something through email and the recipient may delete the messages or you might have deleted it. And when a dispute arises over the sent data or a file or an attachment, it’s hard to find out whose fault it is. Internet has its own advantages and limitations. A more efficient technology is required which records all the communications as transactions which then can be retrieved and accessed. It is blockchain technology. 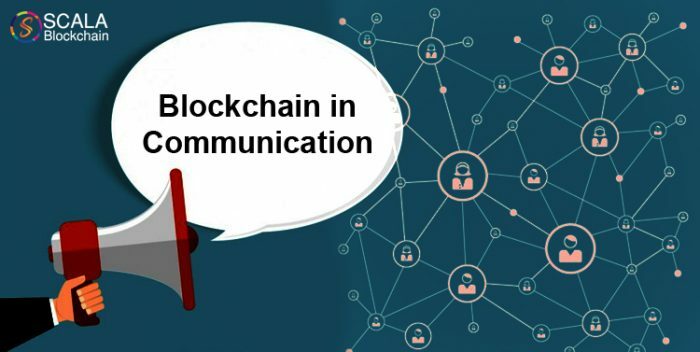 If we integrate blockchain in the communication channels and systems, all the messages along with attachments communicated to one or more recipients are being stored in a block. The block keeps on growing and each of the blocks are secured with cryptographic hash functions. Blockchain is ultimately secure through cryptography and thus the need to eliminate centralization happens automatically. Blockchain will offer decentralized communication systems through the usage of dApps or Decentralized applications. Dapps can be built on top of ethereum which enables the smart contracts to be built. These smart contracts are written in programming language depending upon our needs. Since ethereum supports the usage of solidity, it can be used to write smart contracts. The smart contracts should adhere with erc standards written by ethereum community. That’s when it truly is a decentralized application. In this technological era, the use of communication tools is growing widely and when the decentralization strikes, it’s going to revolutionize how we communicate with our peers. Taking this in consideration, scalablockchain setup a team of blockchain developers to develop decentralized messenger apps with future-ready approach. Being a pioneer in blockchain technology, ScalaBlockchain covers a wide range of industries in blockchain technology to offer businesses a cutting edge development. All the blockchain applications are built from scratch and are customized accordingly. Whether you want to build a messenger app or need to embed chat feature in your shopping app or in any other application, scalablockchain can help you with the customized decentralized chat application suitable for your business needs. What are you waiting for? Enquire and get a quote from us.